We have waited months for this day—the day when the last of the Kentucky Derby prep races will be run, the last Derby qualification points will be distributed, and the field for the 141th renewal of the "Run for the Roses" will be more-or-less established. On April 11th, the Road to the Kentucky Derby will end with a bang at Oaklawn Park when eight horses contest the $1,000,000 Arkansas Derby (gr. 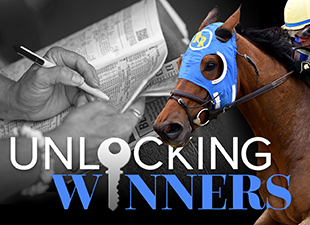 I), including the exciting and practically untested Kentucky Derby favorite American Pharoah. Is he the budding superstar that many believe him to be? We find out this Saturday. Let’s take a look at the Arkansas Derby entries! On paper, it looks very, very hard to beat American Pharoah. The Bob Baffert-trained colt won the Del Mar Futurity (gr. I) and FrontRunner Stakes (gr. I) in impressive fashion last year before being sidelined with an injury, but he returned on March 14th to win the Rebel Stakes (gr. II) at Oaklawn by 6 ¼ lengths. In that race, he handled an unfamiliar sloppy track, a stumble at the start, and a loose shoe to win eased up in completely dominant fashion, and his ability to finish strongly in the homestretch is a valuable asset that makes him difficult to defeat. Having turned in two stellar workouts in preparation for this race, and having drawn post six in a field of eight, he should have little trouble flashing his speed from the start and dominating the race. With a trio of triple-digit Beyer speed figures under his belt—none of his rivals have earned a figure better than 91—I think he is going to win once again this Saturday, and do so impressively. But of course, that isn’t very creative from a handicapping standpoint, so let’s see if we can find some value to use underneath American Pharoah in the exotics. On the morning line, Madefromlucky is the third choice at 6-1, and he certainly warrants respect. In the Rebel Stakes, he tracked American Pharoah’s slow pace while saving ground and out-finished Bold Conquest to claim second place by 2 ½ lengths. The circumstances could be trickier today as Mr. Z and Bridget’s Big Luvy are bound to ensure a faster pace, and since Madefromlucky has drawn in the middle of the field with speedy colts on his inside and outside, I think he’s going to find himself boxed in early on with nowhere to run. Perhaps he’ll find a seam turning for home and work out another great trip, but I don’t think he has as much room for improvement as some of his rivals. I won’t be surprised at all if he runs well, but I think he’s worth trying to beat in the exacta. One horse I really like is Bold Conquest, a 20-1 shot on the morning line. He finished third in the Rebel after racing closer to the early pace than usual and flattening out in the homestretch. I thought it was a solid effort given that he raced wide throughout over a sloppy track, which I don’t believe he cares for as much as a dry track. He should enjoy the fast track expected on Saturday, and notably, he has been able to train on fast tracks in preparation for this race—in his last two workouts prior to the Rebel, he had to train in muddy going, which has not been the case in the lead-up to the Arkansas Derby. With more early speed to set up his late run, and with two sharp workouts under his belt, I think we’re going to see Bold Conquest take a major step forward on Saturday. He is my choice to round out the exacta. Far Right is another that deserves attention after winning both the Smarty Jones Stakes and Southwest Stakes (gr. III) at Oaklawn with impressive late rallies. However, in both races, pace meltdowns greatly enhanced his chances, and if the pace is more modest on Saturday, that could compromise his late run. The same goes for The Truth Or Else, who took advantage of the same fast pace in the Southwest to rally from way back and finish second. When faced with a slower pace in the Rebel Stakes, he found himself much closer to the early lead, but failed to produce a run in the homestretch and wound up finishing fourth. He will add blinkers on Saturday, perhaps in an attempt to keep him closer to the pace again, but unless there is another pace meltdown, I think The Truth Or Else can be beaten in the exotics. I would also like to briefly mention Bridget’s Big Luvy and Mr. Z, two of the expected pacesetters. The former has already won at nine furlongs, having triumphed by 2 ½ lengths in the Private Terms Stakes at Laurel after setting a good pace over a sealed, muddy track. He may be 20-1 on the morning line, but figures to be one of the early leaders on Saturday, and I see no reason why he can’t take this field a long way on the front end. The same goes for Mr. Z, who finished last in the Louisiana Derby (gr. II) two weeks ago. Many feel that he has been raced too often, since he has run at least once a month dating back to his debut in June 2014, but I don’t think he should be tossed from consideration after one poor effort. If you’re willing to forgive his Louisiana Derby performance, and judge him on his previous form, he warrants a very close look on Saturday. After all, he set the fast pace in the Southwest and was beaten just three-quarters of a length by Far Right and a nose by The Truth Or Else. So to recap, American Pharoah is my solid selection to win the Arkansas Derby, with Bold Conquest my choice to round out the exacta over Madefromlucky. To add value to the superfecta, it might be worth taking a shot with Bridget’s Big Luvy or Mr. Z in the underneath slots while using Far Right as the best of the deep closers in case the pace gets contentious. Now it’s your turn! Who do you like in the Arkansas Derby?